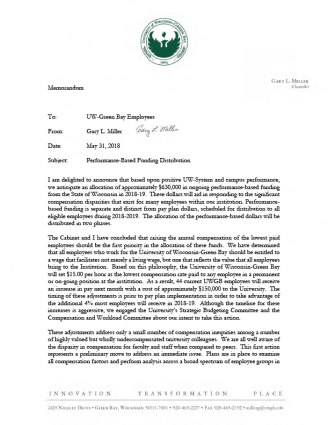 The UW-Green Bay Office of the Chancellor emailed the following memorandum on Thursday, May 31, 2018 notifying UW-Green Bay employees of an anticipated allocation of approximately $630,000 in ongoing performance-based funding from the State of Wisconsin in 2018-19. I hope you are enjoying Employee Appreciation Week, a special time set aside to enjoy the camaraderie of those we work with and to say thank you. Your dedicated service and commitment to UW-Green Bay, our students, and the State of Wisconsin is remarkable. In ways large and small, your work touches the lives of many people every day. Watch our video to see how much we need you and your talents at UW-Green Bay. The challenges we encounter in higher education we face together. I feel very fortunate to be a part of such a talented workforce of people dedicated to delivering on our mission and am proud of what we’ve accomplished together this year. Our future at UW-Green Bay is bright. Simply put, there’s no UWGB without U. I hope you are enjoying the activities taking place this week and a semester end filled with great accomplishments. Thank you again for your exceptional service and commitment to the University of Wisconsin-Green Bay. I hope to see you at the cookout.